Want bigger legs in a hurry? I can get that for you…if you’re willing to do the work! As with the previous ‘Chest Blast‘ and ‘Arms Blast’ workouts, where trainees got up to 3 inches of permanent size in a little over a week, there should be a way to increase the size of our upper legs if we use the same kind of “hyperintense” techniques. These are techniques you’ve never heard of, and certainly never tried. And yes, the new size attained will be permanent. If you want to experience this workout and give me your feedback/results, leave your details below (scroll down to see what details I need). Once I take note of your email I will delete it, so don’t worry about others seeing it. I need about 20-30 people, so if you’re interested, get in early! * If you don’t like pain, don’t sign up! * If you don’t regularly train to positive failure in each set, don’t sign up! This training is going to take you beyond positive failure. * If you won’t take regular measurements of your legs and send me your results, don’t sign up! However, if you CAN push through pain to achieve your goals and will take measurements and send me your feedback, leave a comment below with your details. Men and women of all ages are welcome. This is free. There is no charge for participating. I will almost certainly send out the full workout to successful applicants on Monday 28th December 2015. I will want you to read over it and familiarize yourself with the workout during that week. Then you’ll do the training the following week i.e. week starting Monday 4th January 2016. What a great way to start 2016! You will then send me the feedback/results during the following days and weeks. NOTE: Leaving your details does not guarantee that you’ll be selected. I will select a cross-section of all ages, genders, and training experience. 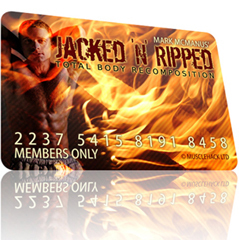 NOTE: There are just 2 weeks until the next intake of members for the MuscleHack Jacked ‘N’ Ripped program! Monday 4th January 2016. Get more details on this program here. Please do get your spot this time – this is your opportunity to experience the power of building muscle and burning fat at the same time in 2016! There won’t be another chance to come on board until the Springtime of 2016. Obliterate blubber & set a NEW BODY FAT “SET POINT“ – and keep it FOR LIFE! Pack on muscle and strength like NEVER before! Wouldn’t it be nice to STOP the endless cycles of bulking and cutting once and for all? Now you can accomplish BOTH at the same time and go DIRECTLY to your goal level of muscle mass and body fat in one continuous phase! The “Build & Burn” code has been CRACKED and is ready for release to the public! Coming Monday 4th January 2016 – I’ll email and announce on Facebook and Twitter to remind you guys. I’m 27, male, with about 18 months training. Would love to take part. I left my email in the email field. I’m 21, male and 4 years of training experience. .
I’m 21, male and 4 years of training. ..
I’m 21, male and have 4 years training experience. .
I’m 36, female, with 14 yeras of training experience. Thanks Mark, this should be great! I’m 21 (male) with a little over two years working out and would definitely give this a try! ◾YEARS/MONTHS OF TRAINING EXPERIENCE: 12 months. Age 34, male. Approx 3yrs training experience (including arm blast, chest blast and THT). Hi Mark, would love to try it. Did the chest blast and got great results! Would love to try this. Been training for 20+ years! I’m male, 38 and I’ve been training for about 5 years, on and off. I’ve been doing the THT 3 day full body routine for about 2 – 3 months so far and I’m making steady gains. Hi Mark. Thanks for giving us the opportunity. I’m 35, male with training experience of around 12 months. I would like to take part on the leg program. I’m 30, Male and been training for just over 3 years. Legs have always been a weakness of mine so I’m keen to be a guinea pig, if I see results anyone will! Hi Mark, I’m 47, male and and I’ve been training 8 years. I want to try your leg training program. Thanks! I’m 21 male with about 18 months of training. I would love to participate. Would really like the opportunity to take part in this. Hey Mark I’m 36 female training for 3 years and really excited to bust my legs open… Thanks.. D C.
25, male, been training off and on for a while with past 8 months of consistent THT training. 10 yrs of weight training. Im a 19 year old male. Started going to gym 3 years ago. Iv been seriously working out for more than a year and a half. I’d love to be a part of this as legs are somewhat my weak body part. 43, training for 1 year. Only have access to free weights and incline/decline bench. Oooops – I’m a male. Male 45 with 5 years training experience. Would love to take part in the experiment. I will take measurements ans will go past positive failure as required. I can take the pain and i welcome it. Let’s do this. Hi Mark, I’d love to give this a try. Training for : 5 or so years on and off but been on THT for one dedicated year. I’ve always struggled with legs finding squat progress almost impossible on the 5 day split.. But have worked my way up to 78 kg for 10 reps doing the 3 day cycle. Age 30. Male. 10 years of experience. Email in email field. 20 weeks of THT about to start 3 day 6-8 reps phase. Ready to rip… Have great upper body advancements over the years. Tht has stepped up my game… But my legs just wont grow… Help me! I am 39, Indian and have been training for the last 5 years. hey mark I’m 37, male, with years of different training modalities . Would love to take part. I left my email in the email field above. I’m 37, male, with years of training experiences. Would love to take part. -training experience: I have about 3-4 years of (not consistent and moderate training). Extra: I really have not seen any mass gains on my legs only strength really. I think I’m classified as an ectomorph. I love to take part of your experiment and get rid of these chicken legs! Training in the gym for 6 years. Musclehack for 3 years. Currently in University so lots of free time that I should be working in. Age 28, male, I’ve played sports my whole life but only seriously lifted weights for about 2 years. Get me in on legs blast so I can finally dunk! I’m not sure if vertical leap is a measurement you were planning to test but I need another 5 inches or so. 57, male–training off and on for 20 years but only seriously last 6 months. Would love to be in the test. Love the info! Thank you. 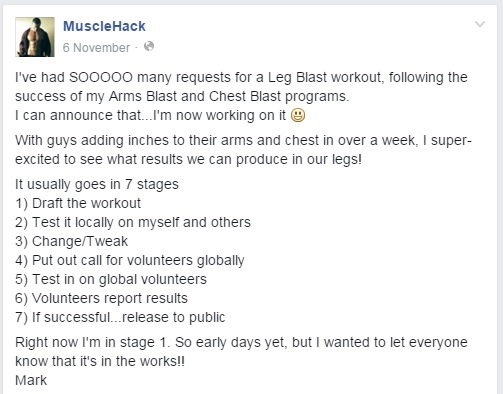 Haven’t tried a leg programme for some time – sounds great! Please give me a shot at this Mark, I’ve been following your archive articles since 2011 and have always wanted to give something like this a go. Super Skinny Legs – Need Help!! Would love to participate, I have been squating everyday for month or so, been training legs like a beast, not much growth! Been training for 4 yrs, 37yrs old 5ft10in 189lbs. 20 year old male. Training and experience is about 2 years. Excited to see the results! I’m a 46 year old male. 12 years training around 200 lbs (I’m at work so I can be more exact after I get off.) Always looking for new way to blast quads and hams. Training 3 years with a plan. 41 yo male, 3 years seriously working out, with equal concentration on upper and lower body. 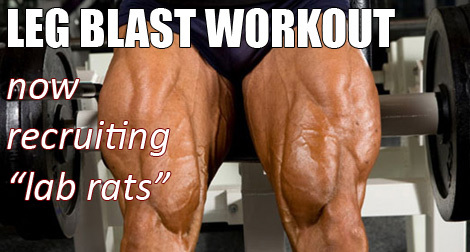 Eager to try your Leg Blast! Happy to be a guinea pig. Absolutely love to be a guinea pig. No pain no gain! ? My name is Chris, I’m 44 years old, 5 years of training. Really want the shoulders/traps blast will hold out!!! 16 years old, male. For the first year and a half of my training i always skipped legs (i know im a bro lol) But i would love to do this program, i will be starting prep for a mens physique show too and this would help me alot! Now i am at about 2.5 years of serious training, but i grew up doing tons of pushups, pull ups, tree climbing, etc. 16 years old, male. For the first year and a half of my training i always skipped legs, But i would love to do this program, i will be starting prep for a mens physique show too and this would help me alot! Now i am at about 2.5 years of serious training, but i grew up doing tons of pushups, pull ups, tree climbing, etc. Would love to be your lab rat. 10 years real training and experimentation! Mark, My wife wants to do this. We workout together and she always complains because I have a bad back and knee and can’t do legs as much as she likes to. She is 45 and a personal trainer. She works out religiously and uses THT with some of her clients. I have been a muscle hack guy for at least 3 years. Give her a shot. I am a 56 year old male. I had been working out regularly for about 4 years but have had to take a break for the last 4 months or so. Hi, I’m a 19 YO male. I have been training about two years. Dan, 25 male, 7 years training experience. I’m a 19 YO male. I have been training about two years. 2 years Training Experience. 8 months incorporating THT Method. 28 – Male, ~6 years training experience. I just completed my first THT cycle and documented everything on my website. Feel free to take a look! Loving the program so far. ◾YEARS/MONTHS OF TRAINING EXPERIENCE: 10 years off and on. My name is Glenn Mapp. I am 29 years old male and have been training for 8 years. Cant wait to hear from you! I have been reading your blog’s and emails for 3 years and I am READY FOR THE PAIN! What equipment is needed for the program? 30, Male, 8 years. I’m 50, male and 20+ years of training experience. I have completed 9 weeks on the TSPA program and am currently around 12% body fat from 21%. So I guess it will take me another 2-3 weeks to achieve my 10% body fat goal as per TSPA. At the same time I would also like to be a part of the leg blast experiment, is it possible for me to be a part of it along with TSPA? Secondly I also want to join the JnR but according to my calculation, on 4th January I’ll still have about a week left to achieve 10% body fat. So my question is, Can I join JnR on 4th Jan or should I wait for the next program in spring ? Lastly can I do both ie. leg blast experiment and JnR simultaneously ? If not, then my choice would be the JnR program since after achieving my six packs through the TSPA, I now want to add on size. Hi, I’m female, 29 yo, I just have 1month training with your THT program but I’m really crazy to gain muscle on my legs!!!!! Looking forward to hear from you! ◾YEARS/MONTHS OF TRAINING EXPERIENCE: 15 years competitive bodybuilder. Age 43 two years training.love to try new training ideas. I am 45 male and have been training for 3 years, using THT training for 6 months. Training off and on for about 2 years. Been training seriously THT style since September. Hi Mark, I would really like to do this. I’m a hard-gaining ectomorph, but have made my best gains with THT the last 2 years. My legs are now defined and strong, but still not as big as I’d like. I don’t think my first comment went through, if it did, please delete it. I’m a 19 year old male. I’ve been training on and off for about 2 years, but only began consistently training THT style this past September. Cheers mark hope to get go at it !! Hey, I’m 26yo, male and I’ve been training for about 3 years. Being accountable isn’t a problem. I’ve done THT before as well (also Chest Blast, twice). Would be great to try out that leg routine as well! Hi Mark, 46 year old male, 25 years weight training. THT for last 18 months. 55, male, 29 yrs squatting and the like. Training 5 years. Different goals and sports throughout. I’m willing to give it go with the leg blast! I’m a 52 year old male. Currently training 1 body part each day to positive failure. THT based workout. Hi mark. I’m male 41 years old. I have 10 solid years experience training. Currently using your THT 3 day full body alternating with 4 day split every 10 weeks. Been having great success but my legs are definitely my lagging body part. Willing to put as much effort as possible to boost growth in my legs. 18 years-Training on and off since high school. Your programs are the best! I’m an ectomorph so it’s hard for me to gain mass; would love to test it out and see what’s possible. 8 years of training experience. Missed out on the chest blast so would love to try the leg blast! Hi Mark! I’m 17, Male, with a little over two years of experience. 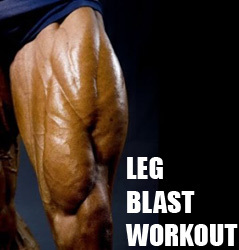 I would like to try the Legs Blast because I’ve hit a Leg muscle growth plateau. Thanks! I’m 47, Male and have been training for 4 years. I have always struggled with developing my legs despite my efforts so this would be an awesome experiment to try. Will give it everything I have. Email in the comment fields – long time subscriber and TSPA purchaser. Thanks for your consideration Mark. It would be great to be a Guinea pig for your leg work out routine. Email address is added Where the email address was requested. I have been training for about 10 to 12 years. 6 years of serious training. I’m male. 44. 10 years of training. Would love to be a part of the legs experiment. I am 40 years old and have consistently used your program for 2 years. I have also done TSPA and your chest blast program with good results. Hope to take part! I’m 54, Male and have been training for 10 years. I am a male 19 years old with 2 years of training! i would like to take part in the leg blast experiment, i’m a 26 years old male. I’m a 52 year old male and have been training for 3 years now! My legs are my slackers! :) Would love to try it! I am Sam! 41years of age, training for 6 years now. Training under your THT for over 3 years, and have a few followers in GYM who also believes my preach on THT! However, I am disgusted when people call me chicken legs because i do! I have never missed a session of THT , even when hurricane or sick day! I WANT TO SIGN UP FOR LEG BLAST!!!!!!!!! Hi. I have been training for over a year. Very intensive over the last 6 months. Very interested in this. Legs are my strong point, so would be great to grow them. I’m 40, male, been training for almost 5 months now. I’m also your tspa client. Thanks! I’m male, 32 years old. I’m 180, 73kg, 9% body fat. I’ve trained and logged religiously for almost 4 years. I enjoy experimenting and customizing my training and nutrition. Being part of the test group sounds like a great opportunity. Am 34 years male of African descent, been training for the last 6 years. 3 years on Thy. Hi, already left my details on this page (twice, in error). Don’t forget there is always a high drop-out rate when people volunteer, as with your other experiments I’ve successfully been involved in. YEARS/MONTHS OF TRAINING EXPERIENCE: 3 years. Started off by buying your TSPA, then moved onto GLADs THT 5 days a week but for the last six months switched over to the 3 days a week. I can go back to 5 days a week if this experiment needs me to. Happy Christmas and a blessed 2016. Training for three years on and off…always paid out for chicken legs and ready to grow! And to stick it to my mates! Years: About 9 years on and off. FYI, I am a hard gainer so I welcome the challenge!